I attended the Annual General Meeting of Longbeach Place Inc on Thursday. As one of the tutors, I presented my report for the Memories to Manuscript and Life Stories classes I teach, which have been repackaged this year as Writing Creatively Towards Your Future to encompass new technology. The meeting small considering the reach of the community, but not surprising – in my experience, AGMs are deemed perfunctory – either ignored or suffered unless there are problems to be solved, people to be ousted, or financial mismanagement to be challenged! However, at Chelsea, it was a lovely surprise to experience a great AGM. 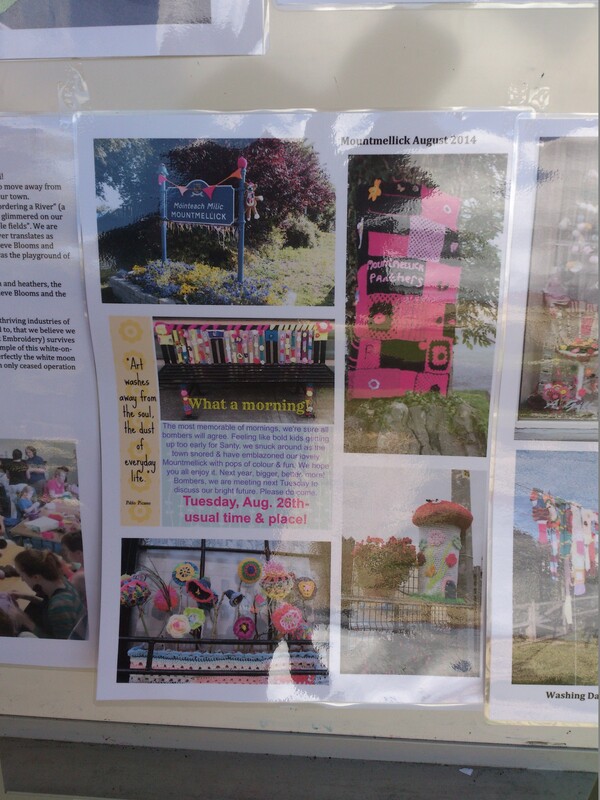 To hear from other tutors about their courses and to see a fabulous presentation about the craft craze Yarn Bombing. (Renamed Urban Yarn Art in deference to connotations in a world consumed by the ‘war on terror’.) The delicious refreshments afterwards and friendly chatter provided networking opportunities to meet and greet locals, the new ALP member, Tim Richardson MP, and Kingston Council representatives. The comfortable environment added to the enjoyment of the afternoon. 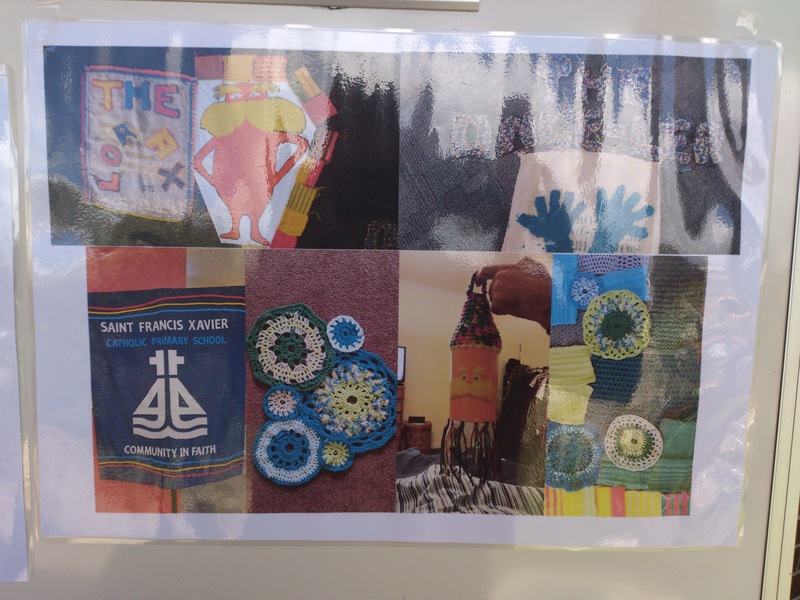 I learned that the old Drop in Craft workshops are now transformed into Create, Make and Take sessions incorporating skills as diverse as pattern making, sewing, weaving, spinning, knitting, crochet and the Storybook Yarn Art Trail, an amazing community project involving several local schools and churches. 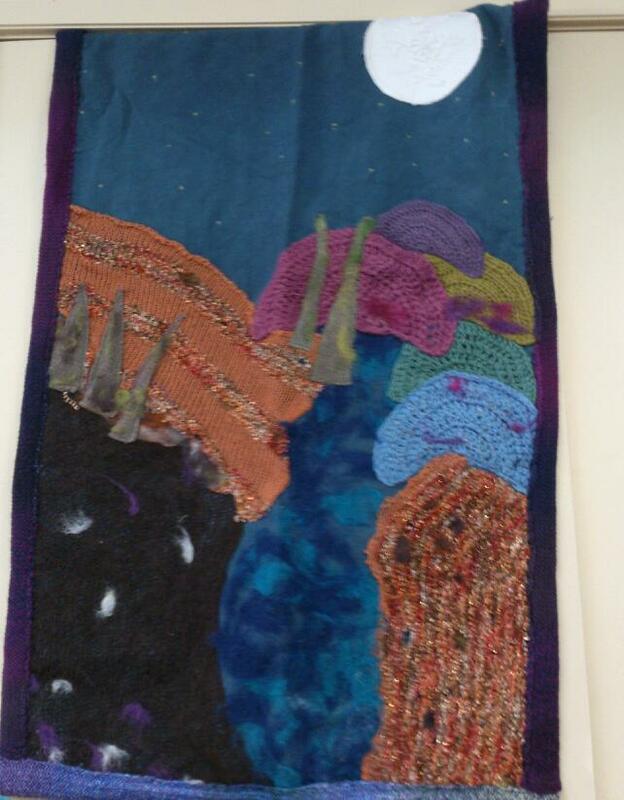 My sister, Cate is the crafty person in the family and I’ve recently celebrated her talent in a post about the Australasian Quilters Convention, but when my children attended a local school with a Steiner stream, craft skills were an enjoyable part of our home life. I see craft as a very important art as well as being perhaps the most useful artistic skill. (Apart from writing of course, but then I’m biased.) 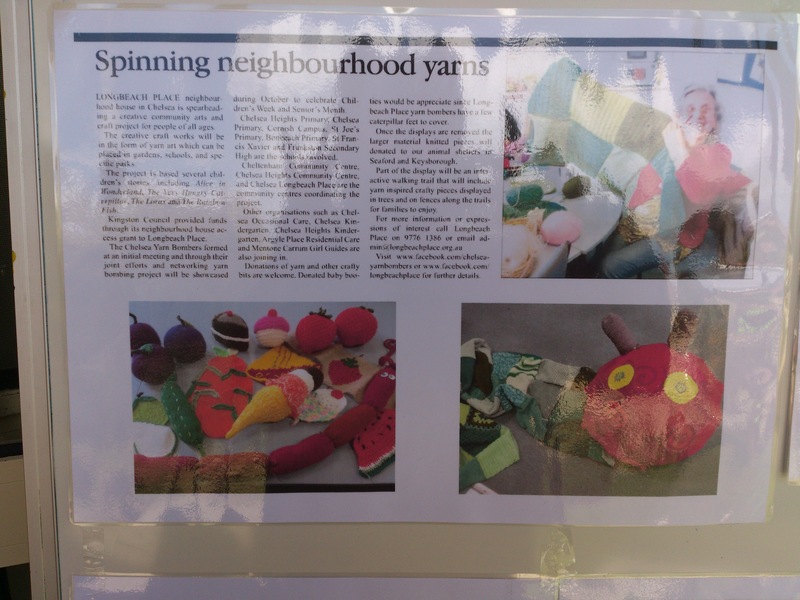 The guest speaker, Elizabeth Alexandreou, the mover and shaker behind the resurgence of craft at Chelsea talked us through the Urban Yarn Art project, the Storybook Yarn Art Trail and explained the importance of passing skills onto future generations. This project inspiring young people to learn craft skills, adapt them into creative projects, connect with different generations and have fun while learning. 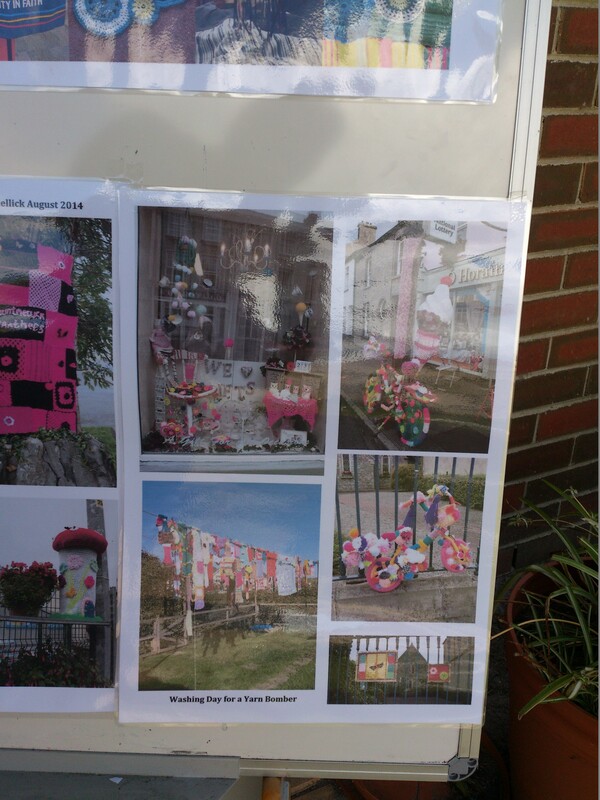 Last year the trail included a Retirement Village/Nursing home – a wonderful way of ensuring people still feel valued in the community and helping to break down barriers between the old and young. 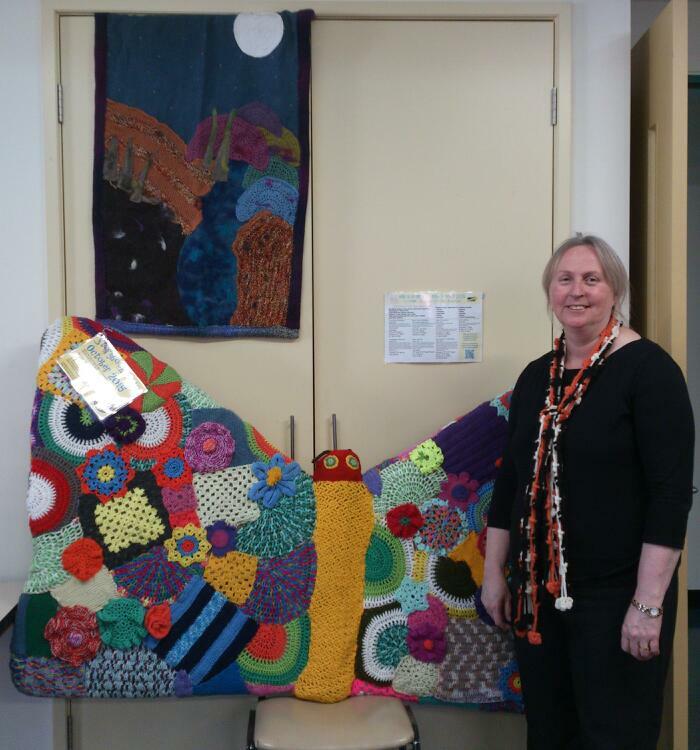 Each organisation participating in the project chose one of several books to illustrate with urban yarn art – Alice in Wonderland and The Very Hungry Caterpillar were popular, and The Lorax by Dr Seuss. A local church chose to acknowledge that Jesus was a refugee and used their creativity to make a plea for compassion in the current climate of political intransigence. 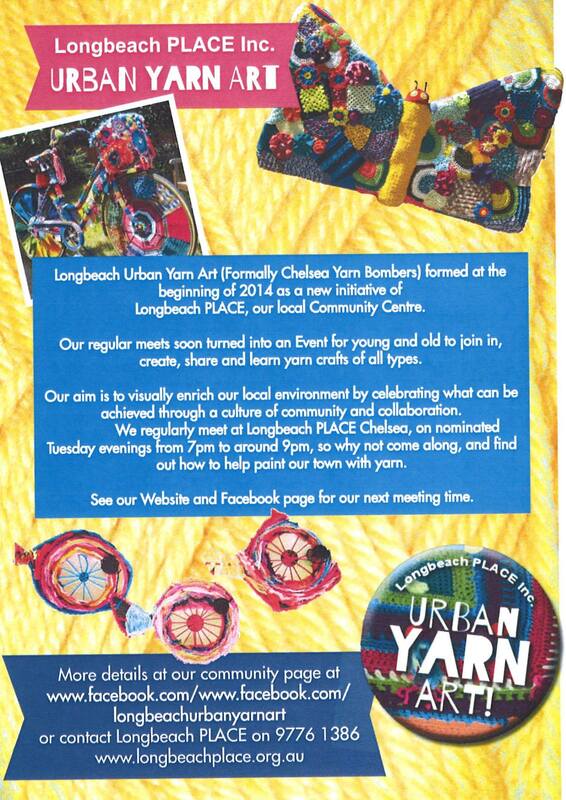 Yarn Art is international and through a participant Longbeach Place Inc shared art with Ireland and at the AGM a lovely wall hanging was displayed that had been posted from Ireland. It is hoped in the future international and national links will expand. In a world of instant communication, but where many people lament the lack of person to person communication, this project is a gift. I photographed Elizabeth and Longbeach Manager Lorna Stevenson with the wall hanging from Ireland and an amazing butterfly created for last year’s display. 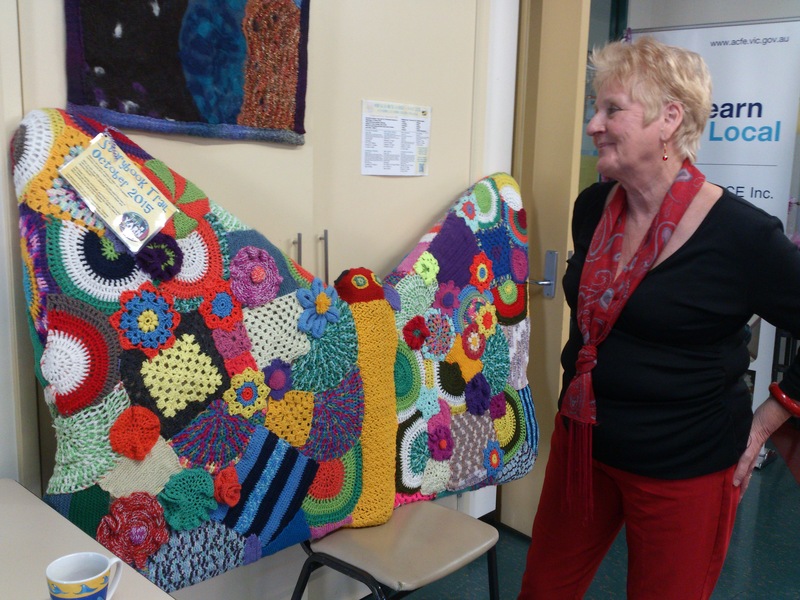 This butterfly involved collaboration with a member of the Men and Women’s Shed group – a further extension of community connections and sharing of expertise. The aim of the crafters is to visually enrich the local environment by celebrating what can be achieved in a culture of community and collaboration. Craft is a fantastic activity to bring generations together and to have fun. Although criticism has been made of wasting materials (wool does degrade overtime exposed to all weathers) to me this is churlish and denies the benefit of art and what creative expression is all about. There are many instances of art projects being fleeting or ephemeral just like so much of the beauty of nature (Mother Earth’s art) is transitory! Of course, writing and craft are not the only courses or programs at Longbeach Place and while Computers For Beginners tapped, we were invited to walk through the garden and admire the herbs and other plants cultivated by the ESL, Literacy and Volunteer Classes in their Herbs for All project. Neighbourhood Houses bring people together to connect, learn and contribute in their local community through social, educational, recreational and support activities, using a unique community development approach. 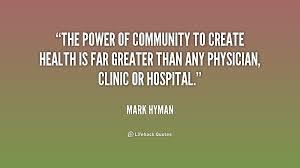 Community development enables communities to identify and address their own needs. 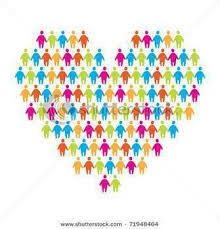 It starts from the assumption that communities have existing strengths and assets that make them part of the solution. Neighbourhood Houses welcome people from all walks of life. 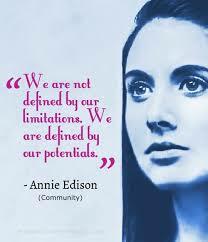 This inclusive approach creates opportunities for individuals and groups to enrich their lives through connections they might not otherwise make, strengthening networks and building social capital. My involvement in neighbourhood houses through learning programs and teaching has enriched my life. Another thread that has enabled me to continue to do what I love – write, socialise, teach. It has helped me stay physically, emotionally and psychologically healthy by encouraging and nurturing a feeling of belonging. I consider myself blessed and encourage others to take a walk to their nearest community centre and become involved – you can learn, you can teach, you can volunteer – you are community. Fascinating, Mairi. Urban Yarn Art? Must try it. It’s the right season anyway Glenice:) When MJ and i were in North America we saw lots of examples – brightens up the neighbourhood. A very impressive article. Thank you so much for you have shown true community spirit and joy. 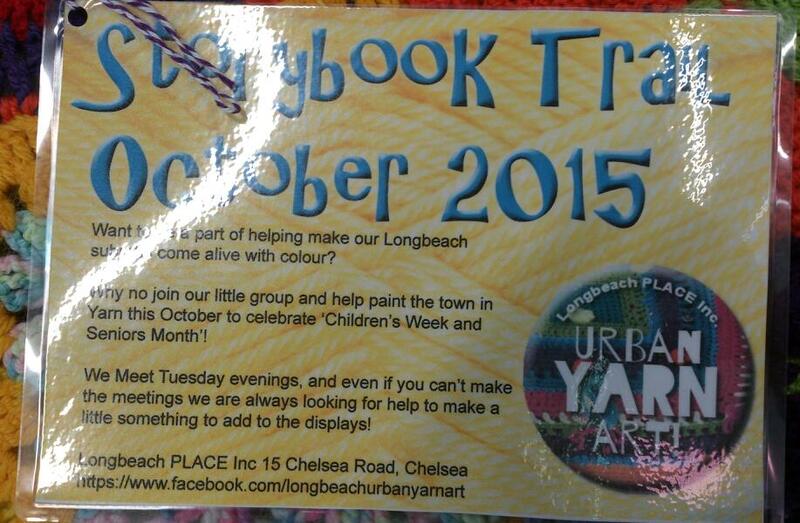 Thank you for your kind words Lorna, the world needs more places like Longbeach!